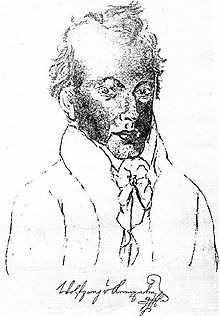 Wolfgang von Kempelen (Hungarian: Kempelen Farkas; 23 January 1734 – 26 March 1804) was a Hungarian author and inventor. He is known for his chess-playing "automaton" hoax, The Turk, and for his speaking machine. Von Kempelen was born in Pressburg, part of the Kingdom of Hungary. He was the last child of Engelbert Kempelen (1680–1761), and Anna Theresa Spindler. He studied law and philosophy in Pressburg, and attended the Academy in Győr, Vienna and Rome. He was interested in mathematics and physics. He spoke German, Hungarian, Latin, French, Italian. Later, during his travels he learned English and Romanian. His first job was in 1755 as a clerk in the Hungarian Court Chamber in Pozsony. Later he became a secretary (1757), a Councillor of the Court Chamber (1764), Director of Salt Mining (1765), Second Commissioner of the Constitutional Commission for the Region of Banat (1769), and finally Imperial-Royal Court Councillor (1787). He also helped move the University of Nagyszombat to Buda Castle, and looked after the building of the Court Theatre in Buda's old Carmelite monastery. He married twice, first in 1757 to Maria Franziska Piani, who died in 1758, and again in 1762 to Maria Anna von Gobelius. Five children were born from his second marriage, of whom two survived into adulthood: Maria Theresia (1768–1812) and Karl (1771–1822). Von Kempelen was most famous for his construction of The Turk, a chess-playing automaton presented to Maria Theresa of Austria in 1769. The machine had a life-sized model of a human head and body, dressed in Turkish robes and wearing a turban. It was seated behind a large wooden box on with a chessboard on the top. The machine could play a game of chess against a human opponent. But it was a trick. There was a person, a skilled chess player, hidden inside the box. The Turk was a really a puppet, worked from below by levers. The Turk won most of the games played during its shows around Europe and the Americas for nearly 84 years. It played and defeated many people including Napoleon Bonaparte and Benjamin Franklin. Kempelen also built a speaking machine. One of them can still be seen in the Musical Instruments section of the Deutsches Museum in Munich. In 1789, he published a book of his 20 years of speech research, Mechanismus Der Menschlichen Sprache Nebst Beschreibung Seiner Sprechenden Maschine. He also built steam-engines, waterpumps, a pontoon bridge in Pressburg (1770), patented a steam turbine for mills (1788/89) and a typewriter for the blind Viennese pianist Maria Theresia von Paradis (1779), and built a theatre house in Buda opened on 25 October 1790 (now Budapest) and the famous fountains at Schönbrunn in Vienna (1780). He was also an artist, wrote poems and epigrams, and composed a singspiel, Andromeda and Perseus, performed in Vienna. He retired in 1798, after 43 years of service to the Austrian Empire. In 1771, Maria Theresia gave von Kempelen an annual pension of 1,000 ducats. After her death, her son Joseph II cut the pensions given to the court's civil servants. In 1802, he tried to get his pension back from Francis II, and also asked for compensation of 20,000 Gulden, but was not granted. At the time of his death in 1804, he owned a country estate in Gomba near Pozsony, but died in his apartment in Alser, a suburb of Vienna. The Wolfgang von Kempelen Computing Science History Prize was named in his honor, as was a high school in Budapest. Wolfgang von Kempelen: Der Mechanismus der menschlichen Sprache. / The Mechanism of Human Speech. : Kommentierte Transliteration & Übertragung ins Englische / Commented Transliteration & Translation into English. Herausgegeben von / Edited by Fabian Brackhane, Richard Sproat & Jürgen Trouvain; Dresden 2017 (Online-Version). ↑ Ricky Jay, "The Automaton Chess Player, the Invisible Girl, and the Telephone", Jay's Journal of Anomalies, vol. 4 no. 4, 2000. ↑ Tom Standage (2002-04-01). The Turk: The Life and Times of the Famous 19th Century Chess-Playing Machine. Walker. ISBN 978-0-8027-1391-9. ↑ Flanagan, James L., "Speech Analysis, Synthesis and Perception", Springer-Verlag, 1965, pp. 166–167. This page was last changed on 28 June 2018, at 09:37.